The military and intelligence communities face a difficult challenge - the need to monitor communications over a very wide frequency range without being detected. Present electronic surveillance systems employ multiple antennas that are either large or noisy. ANTENNA EXPERTS antenna systems provides passive antennas in compact, versatile form factors that provide extreme wideband performance. Antenna Experts offer a wide range of discone antenas covering the HF, VHF, UHF and microwave frequency bands (20 - 6000 MHz) for defense/military monitoring, scanning, receiving, signal intelligence, jamming and transmitting application. Apart from the list appeared below, we are experts to develope antenna with any frequency band. AWD-100-500 wide band heavy duty fully welded discone antenna is specially designed to survive the most extreme conditions, where conventional antennas often fail. AWD-100-500 wide band discone antenna is specially designed for omni-directional coverage. Due to its low VSWR through entire band from 100-500 MHz., this discone antenna can be used as a transmitting and receiving antenna with high efficiency, to meet the broadband requirement of a base station antenna at ATC sites for ground to ground and ground to air communication application without having the requirement of multiple antennas. WD series wide band discone antennas are heavy duty fully welded discone antennas, specially designed to survive the most extreme conditions, where conventional antennas often fail. The wide vertical beam-width of discone antennas allows clear communication for ground, sea, and ground-to-air applications. The fully welded wide band discone antenna is highly suitable for Oceanic application especially in arctic region where vibration and ice loading are main concern. The WD series antennas are fully welded wide band discone antenna uses 6063T6 Mil grade ultra corrosion resistant architectural anodized aluminum alloy with powder coating finish to protect the antenna further from severe environmental condition. All internal junctions are enclosed within a ruggedized radome to ensure survivability in the worst environments. The powder coating on all metal surfaces ensures complete protection from corrosive gases, ultraviolet radiation, salt spray, acid rain and sand storms in desert environments. CWD-20-500 compact wide band passive discone antenna uses 6063T6 ultra corrosion resistant architectural aluminum alloy and is specially designed for omni-directional coverage. Due to its small size, light weight, compact design, low profile and high efficiency of this compact wide band passive discone antenna, ideally highly suitable for measurement of vertical electric field intensity and spectrum monitoring over the 20-500MHz band, to meet the broadband demand of a base station antenna without having the requirement of multiple antennas. The wide vertical beam-width of compact wide band passive discone antennas allows clear communication for ground, sea, and ground-to-air applications. The small size wide band passive discone antenna when packed comes with cone and disc elements removed from the antenna body for ease of packing and shipment. CWD-20-500 compact passive discone antenna uses passive loading technique at lower frequency edge to reduce the overall size of omni antenna while maintaining the excellent efficiency over 96% of the band. CWD-20-500 compact wideband passive discone antenna is rugged all weather model, does not require any field tuning or adjustments. The compact size of discone antenna allows easy handling and specially designed mounting hardware results in fast installation. The powder coating on all metal surfaces of small size compact discone antenna ensures complete protection from corrosive gases, ultraviolet radiation, salt spray, acid rain and sand storms in desert environments. CWD Series compact discone antennas are electrically small and easily transportable antennas, ideally suited for measuring electric fields and for broadband spectrum surveillance applications. The passive circuit design provides perfect balance, eliminating the need for a ground plane in the measurement and communication. Integral passive networks provide outstanding performance over the entire frequency range of operation. The AWD series of wideband discone antenna is lightweight, portable, quickly assembled and designed to MIL grade for HF, VHF and UHF communications. The complete defense discone antenna is supplied with powder coating finish to protect the antenna further from severe environmental conditions. AWD series wide band discone antenna uses 6063T6 ultra corrosion resistant architectural aluminum alloy and is specially designed for omni-directional coverage. Due to its low VSWR through entire band, this discone antenna can be used as a transmitting and receiving antenna with high efficiency, to meet the broadband requirement of a base station antenna such as spectrum monitoring or jamming application. The AWD series wide band discone antenna when packed comes with cone and disc elements removed from the antenna body for ease of packing and shipment. The AWD series wideband discone antenna is rugged all weather model, does not require any field tuning or adjustments. The compact size of dicone antenna allows easy handling and specially designed mounting hardware results in fast installation. The cone and disc hubs of wide band discone antennas are made of chromium plated brass and all fasteners are of type 316 marine grade stainless steel. Discone Antenna termination and feed cable lie enclosed inside the mounting pipe for complete weather protection. "Antenna Experts" would be pleased to discuss your specific requirements in more details. 4. LP-100-3000 100-3000 MHz Entire Band 6 dBi. 10. LPL-20-3000 20-3000 MHz 20-3000MHz 6 dBi. 25. LP-800-2700 800-2700 MHz 800-2700MHz. 9 dBi. 26. LP-80-2000 80-2000 MHz 80-2000MHz 8 dBi. Antenna Experts offer a wide range of log periodic antenas covering the HF, VHF, UHF and microwave frequency bands for defense/military monitoring, scanning, receiving, signal intelligence (SIGINT), jamming and transmitting application. Apart from the list appeared above, we are experts to develope antenna with any frequency band. The LP series ranges of log periodic dipole array are high gain array that provides strong performance over the operating frequency range of 20 MHz to 6000 MHz. as the log periodic dipole array does not use loading technique to reduce the overall size of array. The LP series LPD Antennas features high power handing capabilities, high efficiency, low VSWR and robust mechanical design to accommodate the most extreme environments condition. The defense log periodic antenna supplied with powder coating finish to protect the antenna further from severe environmental conditions. The LP series log periodic dipole antennas use 6063T6 ultra corrosion resistant architectural anodized aluminum alloy and designed to provide wideband directional transmission/reception of radio signals for the specified frequency band. The specially designed mounting arrangement of LP antenna results in fast installation. The extra spacers are used between the support booms to improve mechanical durability of log periodic dipole antenna. The antenna can be assembled in less than 10 minutes. This log periodic dipole antenna system is particular suitable for transmission, reception, monitoring, scanning and jamming applications due to its broad band design feature. This high gain LPA provides strong performance over the entire specified frequency band as the LPDA does not use loading technique to reduce the overall size of array. The LP series antenna has removable elements, making these LP antennas highly suitable for easy of shipping/carrying/transportation and handling. All elements are supplied in two segments for easy of shipping and handling. The elements are attached via stainless steel nuts & bolts systems at points along the boom. The UHF log periodic antenna are supplied complete in assembled condition. The powder coating on complete log periodic dipole antennas surfaces ensures complete protection from corrosive gases, ultraviolet radiation, salt spray, acid rain and sand storms in desert environments also provides extra protection against corrosion in saline weather present in coastal areas. The coaxial cable of log periodic dipole antennas sealed inside the support boom to make it weatherproof. The Log Periodic Dipole Array operates at D.C. ground with low resistance discharge path for protection against lightning and for immunity to noise. All screws, nuts and bolts of log periodic dipole antenna are made of type 316 marine grade stainless steel. 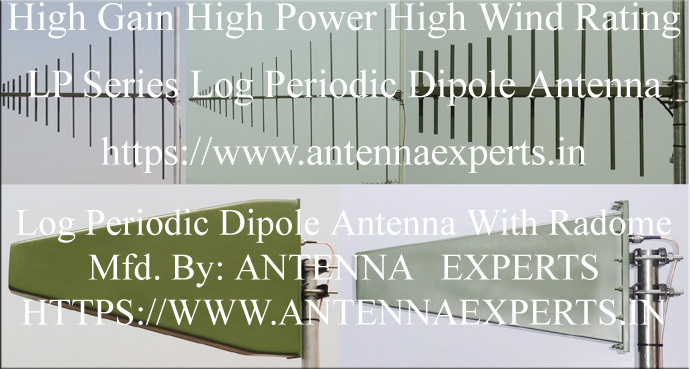 Log periodic dipole antenna above 300MHz are supplied complete in assembled conditions. Optionally these UHF log periodic antenna can be supplied with radome/housing. The LP-20-3000L tactical log periodic dipole antenna is small size log periodic antenna and designed to provide wideband directional transmission/reception of radio signals from 20-3000 MHz bands. The compact size of tactical log periodic antenna is supplied with powder coating to protect it further from severe environmental conditions. The specially designed mounting arrangement results in fast installation. The compact size tactical LP antenna can be assembled in less than 10 minutes. This compact size tactical log periodic dipole antenna system is particular suitable for transmission, reception, monitoring application, surveillance application, signal intelligence application, electronic warfare application scanning application and jamming application due to its broad band design feature, small size and high power handling capacity. This compact size tactical log periodic antenna uses loading technique to reduce the overall size of array. The shipping length of antenna is 6 feet making it highly suitable for mobile and tactical applications. The LP-20-3000L assembled compact size tactical log periodic antennas outer-most dimensions are 3 meters (10 feet) long and 3 meters (10 feet) wide. The small size tactical LP antenna has removable elements, the longest of which is 1.5 meters. Similarly the support boom of compact size log periodic antenna is supplied in two sections for easy of shipping/carrying/transportation and handling. All elements of small size LP antennas are supplied in two segments for easy of shipping and handling. The elements are attached via a fast deployment stainless steel studs & nuts system at points along the boom. The small aperture tactical log periodic antenna operates at D.C. ground with low resistance discharge path for protection against lightning and immunity to noise. All the screws, nuts and bolts of low profile tactical log periodic dipole antenna are made of type 316 marine grade stainless steel. The LP-80-2000 log periodic dipole antenna use 6063T6 ultra corrosion resistant architectural anodized aluminum alloy and designed to provide wideband directional transmission/reception of radio signals from 80-2000 MHz bands. The specially designed mounting arrangement results in fast installation. The extra spacers are used between the support booms to improve mechanical durability of antenna. This log periodic dipole antenna system is particular suitable for transmission, reception, monitoring, surveillance, scanning and jamming applications due to its broad band design feature. This high gain LPA provides strong performance over the entire frequency of 80-2000 MHz as the LPDA does not use loading technique to reduce the overall size of array. The high gain log periodic antenna can be assembled in less than 5 minutes by 2 technicians. Antenna Experts would be pleased to discuss your specific requirements in more detail.